Building green is a movement to improve the quality of design and construction processes of buildings and communities. On a scale of + or – 1500, underground architect and author, Malcolm Wells, charts nature at +1500 for: creating purer air and purer water, using rain water, producing own food, creating richer soil, using and storing solar energy, recycling, restoring silence, consuming waste, maintaining itself, providing wildlife and human habitat, moderating climate and weather, and being beautiful. A typical office building scores -1150! The very basics of sustainable design are to build small, respect the site, provide healthy environments, conserve energy, choose local and renewable materials, conserve water, minimize waste, produce and store food, protect agricultural, cultural, and archaeological resources, and last, but not least, create beautiful buildings! Whew! This is a big responsibility! By building green we can protect the natural world, have a positive impact on the environment and improve our quality of living! One way of going green is to retrofit existing buildings with more sustainable practices like green roofs, passive solar atriums, green house air purifiers, geo thermal and wind power! Activity 1 – How Green Is Your House? Passive solar energy, or the heat and warmth of the sun, is a useful everyday tool that can be important in designing a green building. Basically, hot air rises, so inside a building, we need air movement to keep cool. Having operable windows on at least two elevations of a building allows for a cross breeze, encourages air movement, and allows us to be comfortable without having to use energy to turn on fans or air conditioners. 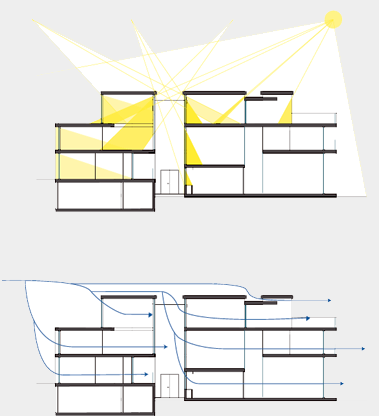 Designing for sunshine also means orienting the building so that there are a lot of windows on the south side to let sunshine in, and fewer windows on the north side where it can be colder in the winter. Analyze your building or house. Draw a plan of the first floor and locate your building’s orientation with a north arrow. Show the range of the sun from the morning to the night. Check out which windows are operable. Open windows on one side of the building, or on the first floor and on the second. See if you can feel a cross breeze! Next draw a section of your house. Show where air movement can improve ventilation. Label these drawings as plan and section and include them in your journal. As cities across the world begin to acknowledge their carbon footprints, governments are looking at where energy is being used proportionately. Take a look Intelligent Building for Today and ARCHITECTURE 2030 to see the problems that the building industry contributes and seek the answers to those problems that are being tested. Make an infographic that shows energy use in the building industry. Is there a green building in your city? Does your city have green initiatives? Look on the web under green buildings. Find a green building and list the important features that have improved on typical construction. Look at Building America, Energy Star, and LEED. Make an outline about the building’s green initiatives. Write a report with at least three paragraphs about: why building green is important, how your chosen building delivers green architecture, and finally how everyday living can be affected by green thinking. Building green is always in the color green. It is important to protect open land. Buildings should be able to produce their own food. Buildings should conserve energy and make use of natural energy sources. Buildings should be built of any materials available.